Springboard has teamed up with Rotary in Brighton & Hove to seek out talented players in the city to be nominated for the Rotary District-level stage of the Rotary Young Musician Competition. The heats (District/Regional) and the National Finals take place in the year following the Festival. have scored 90 marks or more for at least one performance in Springboard. 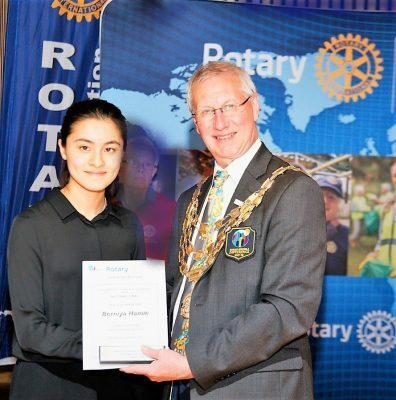 Pianist Berniya Hamie being awarded fourth place in the Rotary Young Musician National Final 2018. Up to six instrumentalists meeting the above criteria with the highest scores for a performance in a class in the Woodwind & Brass, Strings, Piano or Guitar sections can be nominated to compete in the District-level competition in February of the following year. In the event of a tie, the average marks across all classes entered in the relevant sections of that year’s Springboard Festival will be taken into account. Up to two vocalists in the Singing section, who meet the above criteria, can be nominated to compete in the District-level competition in February of the following year.